It's not too early to start Christmas projects! Hello to all of our Block Party patrons! projects! 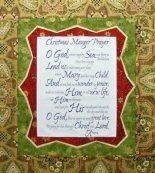 Our "Christmas Manger Prayer" and "Words of Christmas" add the perfect holiday touch to any home! Please have a safe and fun Labor Day weekend!